By our programs and involvement, we are a leader in the community for (solving) issues and problems. With our new temple, I see a new horizon for further participation by members of the congregation, increased involvement with the wider community and greater awareness by people who haven’t known we are here,” says Rabbi Peter Hyman, Temple B’nai Israel, Easton. 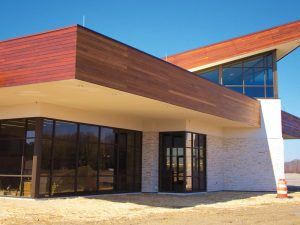 Construction of Temple B’nai Israel, The Satell Center for Jewish Life on the Eastern Shore, will be completed in April with finishing and move in completed in May. Three days of dedication will occur June 8, 9 and 10. Photograph courtesy of Alan Mickelson. This new synagogue was seven years in planning by a combination of temple presidents and board chairmen, as well as dozens of building committee members and fund raisers. During this process a feasibility study was conducted, need for a new building was confirmed and proposals for financing were arranged. Land was visited and compared, architects and construction companies were interviewed, and the solicitation of funds was started. Six acres of land were purchased at what has become 7199 Tristan Drive in Easton, Levin/Brown Architects of Baltimore was hired and Willow Construction of Easton was signed. A Reform congregation located in Easton, Temple B’nai Israel is completing construction of its 9,400 square-foot new synagogue for its 200 members. The synagogue will offer a greater variety of religious and cultural programs for the congregation and the surrounding area using its new full name: Temple B’nai Israel, The Satell Center for Jewish Life on the Eastern Shore. The sanctuary will hold 250 people when fully opened and can be divided into three smaller areas for different functions. There will be classrooms, offices, a conference room and a kitchen built with input from area caterers. Construction will be completed in April with finishing and move in completed in May. Three days of dedication will occur June 8, 9 and 10, 2018 for a building that will have no debt to pass on to future generations. The new synagogue is designed primarily for religious observance and educational activities, yet it has major areas available for use by members of the wider community for meetings, classes and celebrations.